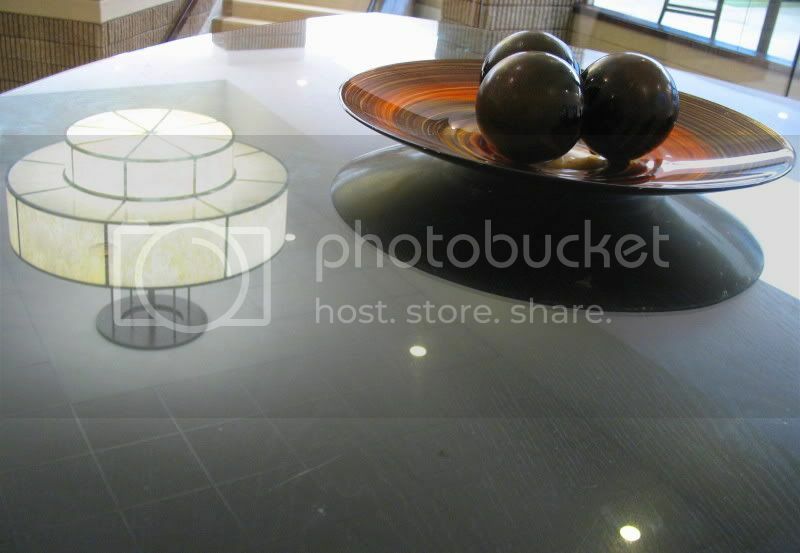 For more participants, please visit the home of Wordless Wednesday. What a cool collection of angles and reflections. At a glance, the light fixture looks like it's on the table... until you look at the sculpture that actually is on the table and realize that there's a reflection missing if... yeah. Very cool! I debated putting a comment in to explain the allusion but I'm glad I didn't because it's more fun seeing the first comment from "Mojo" got it exactly right. When I first glanced at the table, even in person, for an instant I thought the light fixture was sitting on the table. Then I glanced up and saw it on the ceiling. It really was odd how vivid it was. So even thought I hadn't intended to take indoor shots at the mother's day brunch, when I saw that on the way out, after eating, I was glad I had my camera with me. This photo reminds me of outer space - the cosmos, the galaxies. It's a really cool still life. LOVE reflections .. this is super! Wow ... what an interesting reflection. I had to take a double take. Nice job! I too had to take a second and even a third glance...what an awesome photo! I don''t think I'd have figured this one out without reading some of the comments. Very cool! The largest smile came across my face! That is really cool! What a nice shot! I love how the reflection still looked real! Wow! Made me pause and figure it out. Great shot. I had to look at your photo twice, well done! Great reflections, Carver! Excellent -- very cool reflections. So glad you remained wordless. This photo "reflects" well on your talent! It reminds me of outer space. Beautiful composition, I loved the idea about the reflections!WEll done! ** we are going out for some days, I wish you a great weekend. Wow i never seen any thing like it. You pobably had a good camera. It took me a second to get this one. Great find and photo!